At Artis Senior Living, we specialize in providing personalized memory care in Bethel Park, PA, for our valued residents. We practice the philosophy of Positive Partnerships the Artis Way. Our experience supports two-way communications as an effective method for customized memory care. It’s important for us to connect residents with the specific resources they need and desire. We believe they deserve a say in their care program and their life here. Partnership Profiles, Town Hall Meetings, and Time to Dish are tools we use to ask for and make use of resident opinions and input. 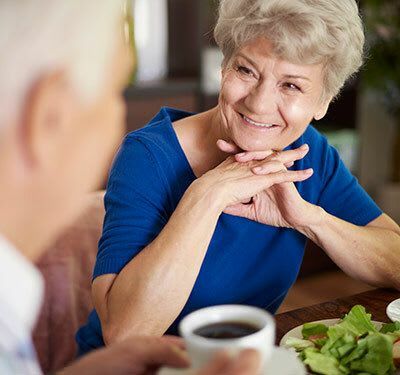 At Artis Senior Living of South Hills, consistent, two-way communication ensures residents get the care they need to live comfortably and a welcoming community. Contemporary research indicates a Mediterranean diet may help prevent and slow the progression of Alzheimer’s and memory loss diseases. We incorporate these practices into our recipes and food preparation. We believe in a holistic, caring dining approach to dining for our residents. Good nutrition is essential to the Artis experience. Residents contribute their opinions and recipes at Time to Dish, a community meeting focused on food and nutrition. At the heart of Artis Senior Living of South Hills, the Town Center acts as a gathering space and wellness resource center for our residents. In addition to arts and crafts, special events, and exercise classes, residents can visit our beauty salon and barber for a manicure or a haircut. Residents can access the private courtyard for a stroll in the fresh air. The Town Center also offers opportunities for residents to join a community service project. Through this program, residents can write letters to veterans, make wreaths for a new Habitat for Humanity home, and more. We offer respite care for those times when you need support for recovery from an illness or injury, or simply a little time away from the daily demands of caregiving. Schedule a tour and discussion with the care partners at Artis Senior Living of South Hills to learn more about memory care in Bethel Park, PA.